Like many dolphin species globally, bycatch (i.e. being unintentionally caught in a net) is a major threat to humpback dolphins. In South Africa, bycatch in shark nets is a particular problem for the species. Shark nets are gillnets set at beaches in KwaZulu-Natal, South Africa to cull sharks, because lowering the population of sharks has reduced the incidence of shark attacks (Dudley 1997). 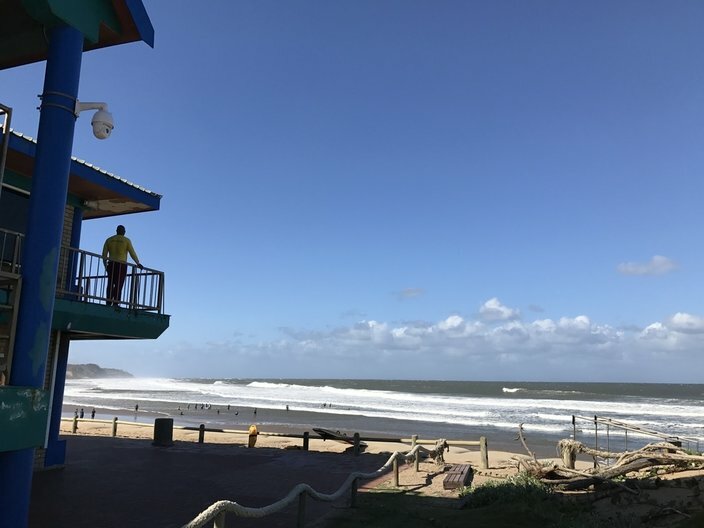 We know that Richards Bay is a hotspot for humpback dolphin bycatch and we've identified the net off Newark Beach as the net that catches the most humpback dolphins. How often do they visit here? Which parts of the area do they use the most? What do they do here (feed, travel, rest, etc)? What are the environmental conditions like when they come (eg swell height, current direction, water clarity)? Using the resulting information, the KwaZulu-Natal Sharks Board will be able to adjust their strategy so that the dolphin bycatch can be minimised. We have installed a video camera so that we can monitor dolphins in this area and will be placing a microphone (aka a hydrophone) into the water near the shark net. You can participate in our study by watching the video footage and letting us know when you spot dolphins. To learn more, see our Frequently Asked Questions click here.